If you’re one of those people who’s always cold, you’ll know that sometimes the central heating just isn’t enough! Not to mention how expensive it is to heat your home to even the minimum level of 21 degrees, which often doesn’t feel like the ‘comfortable’ temperature it’s supposed to be. A luxurious and economical solution to this is Lanaform’s gorgeously soft heated overblanket. By heating just yourself rather than the whole room, you can save a lot of energy and money. On its highest setting, the blanket uses 120 Watts of power; a low energy electric radiator uses 400-800 Watts while the average fan heater uses a whopping 1500 – 3000 Watts! 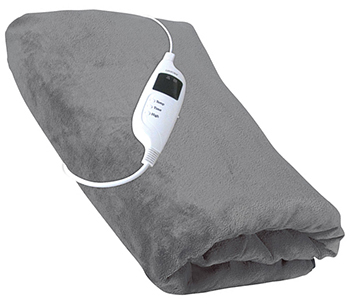 Lanaform’s electric blanket features a remote control with an LED screen that shows you which of the 7 different heat settings you’ve selected. Find the perfect temperature for you by cycling through each one; the wired remote is always nearby so that you can change it at any time if you start feeling chilly or too warm. You can also set a timer for anywhere from 1 to 9 hours; the blanket will turn itself off at the end of the time selected, so it’s great for if you want to use it while sleeping. The ‘High’ button allows you to quickly pre-heat your blanket on those tough winter days when you just can’t wait to warm up! The Lanaform Overblanket measures a substantial 160 x 130cm (5ft2” x 4ft3”); the perfect size for snuggling up on the sofa. The silky fabric feels lovely against your skin and is machine washable – simply detach the remote control and set your machine to a 40 degree delicate cycle. All of Lanaform’s heating products feature overheat protection for your peace of mind; in the unlikely event of a malfunction, the blanket will shut off immediately. Safe and customisable comfort is yours all year long with this wonderful heated blanket! Staying warm, rest and relaxation. 1 x blanket with remote control, power cord and instructions. 120W / 220-240V / 50Hz / UK Adaptor/plug. Factory fitted, screw fixed adaptor to the EU plug. 160 x 130cm / 5ft2" x 4ft3"